I’m writing this entry from work today. Normally I would wait until I get home but I’m currently without wifi. You see, I finally moved to Satori and moved out of the house. Last Monday was the last day I had wifi access and it’s been a busy week since. Thursday and Friday I worked from home and was tethering internet from my iPhone because I had paid for seven gigabytes of hotspot data but I ran it out within two days. I guess you can consider me a high-bandwidth user, mainly due to the amount of internet is used for work. I even went through the effort of picking up a ubiquity bullet and antennae so I could boost signals coming from the businesses and other boats but surprisingly here in Seattle, there is nothing I can use sufficiently to surf the web. I guess the booster will get some use somewhere that actually provides free wifi. Ah Seattle, you amaze me with your tight-wad and paranoid ways. Fortunately Comcast provides internet to the marina. I absolutely despise Comcast with a vengeance but there is nothing else I can do. Pay the bastards and get back my badly needed internet or never work from boat again. Not an option. Another great thing that has happened over the last week is some progress has been made on getting a new mainsheet installed. Satori can finally get back to sailing! I picked up a 4:1/8:1 block and cleat system for the traveler and XLS 3/8″ polyester double braid for the sheet. To measure the length needed for the mainsheet, you push the boom all the way out until it hits the spreaders and then multiply by eight (for the 8:1 system) and add twenty percent for extra line to work with. I may shorten it a bit when I do the end-to-end splice after taking it out for a test drive. It seems much longer than I need and can’t figure out why I needed to add twenty percent. Anyways, I’m happy with the setup and also the placement of the boom in the gallows cradle. Since I’m not going to use the center cradle anymore I can make my bimini arch higher which will shed water properly. So far I like the way it is installed with the exception of the snaps I installed. They keep coming unsnapped because of the amount of pressure on them so I think I will replace them with common sense fasteners so it’s drum tight and secured. I can’t wait to make up the next part this week. Bimini with solar panel attached. New mainsheet set out of the way while parked. On the list of projects is also some lee cloths for places where I can keep gear safe while underway. I made the first one which contains books, my violin and camera gear in the settee. I bought some really nice netting and 1″ polyester webbing and some nice stainless eye straps and clips. This will not prevent small items from escaping through the sides but will keep most things from falling out when the pitch is steep enough. Mainly just peace of mind for when the boat is underway and so I can keep things there without having to stow them. Last Thursday I took the day off from moving as I’ve been going hard every day for the last month. A little rest and relaxation on an eighty degree day and I also climbed the mast to check out the masthead and spreaders. Everything checked out just fine. I also noticed that my slip neighbor has her boat turned away a little bit and Satori was sticking out quite a bit on her stern so I made some adjustments to pull her in a little more with a similar angle as the other vessel. So far the live aboard life has been great. I took a shower for the first time since I installed the new shower drain and it worked great. The shower curtain is a quick drying hydrophobic fabric used on tents and sleeping bags and when I shook the water off it dried within an hour. The bathroom is all varnish and it also dried quickly so I am glad that it all worked out as planned. I don’t planning on showering on board very often but it’s nice to know I can and that the whole system works much better. There are some kinks to work out, like refinishing the shower pan board. It still smells like the old septic that was leaching into the wood back before I remodeled the bathroom but in time that one will also be ticked off. I’m also back to commuting to work by bike. I did my first ride since last summer and it took only forty-five minutes. Another co-worker is commuting from Ballard and we’re planning on coming up with the best route to avoid the gridlock that occurs downtown around Union. Going from Shilshole to Denny is simple; take Dexter from Fremont. Getting through downtown is a different story. With proper planning I’d bet I can cut the commute down to thirty minutes. It’s not a matter of how fast I ride as there are still a number of stop lights to sit through. Anyways, that’s all I have for now. Thanks for stopping by. Ask me anything that’s on your mind. Moving onto a sailboat is probably not nearly as difficult for someone who lives in a small apartment, but for someone who has lived in a house for the last four years and shared a house with other people for most of my life, getting rid of everything is no easy task. At least, getting rid of everything responsibly. If I didn’t care about any of it I would just load up a moving truck and send it all to landfill. Eventually it will all go there anyway so I would simply be delaying the inevitable but I do like to think that I am somewhat environmentally responsible. Most of it has been dropped off at the local Value Village and there are more trips to come. I’m also able to sell some of the high ticket items and give other stuff to friends but that is a very time consuming endeavor. For each item I would average thirty minutes to an hour of time spent selling or giving it to people I know. Value Village is one stop delivery so I can drop the number to five to ten minutes. A dump run is the fastest but the least satisfying. The most valuable give-away so far I think is the topsoil along the fence. You’d think it was just dirt and would just get covered up with beauty bark again but it was my first experiment growing my own food. 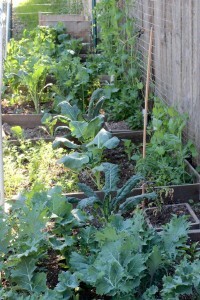 The first year I started with four 4’x4′ raised beds but the following year I doubled the amount of growing space. 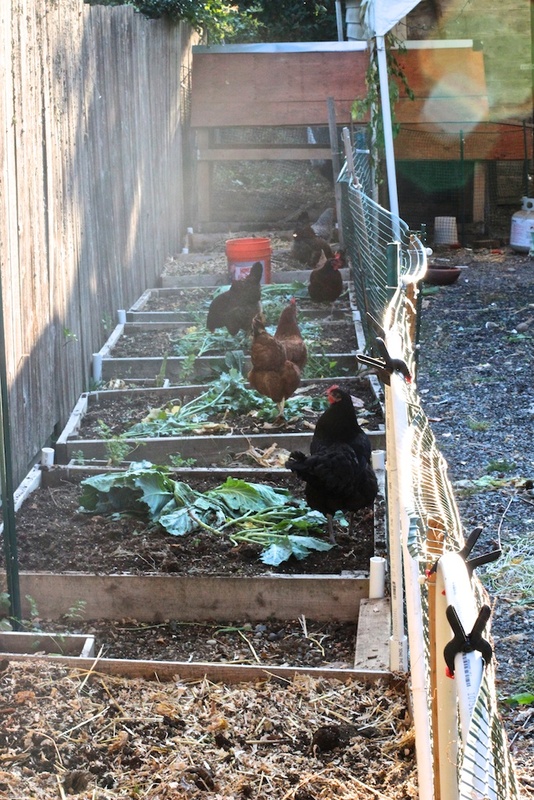 The next year I built a chicken coop and raised a flock of egg laying hens. They were very productive at keeping the greens thinned down and pooped wherever they roamed. I kept them in a pen for a while and they ate the grass bare and fertilized the soil. This allowed me to reseed the grass in the yard and in the off season they roamed in the garden area and picked the place clean of anything that once lived. 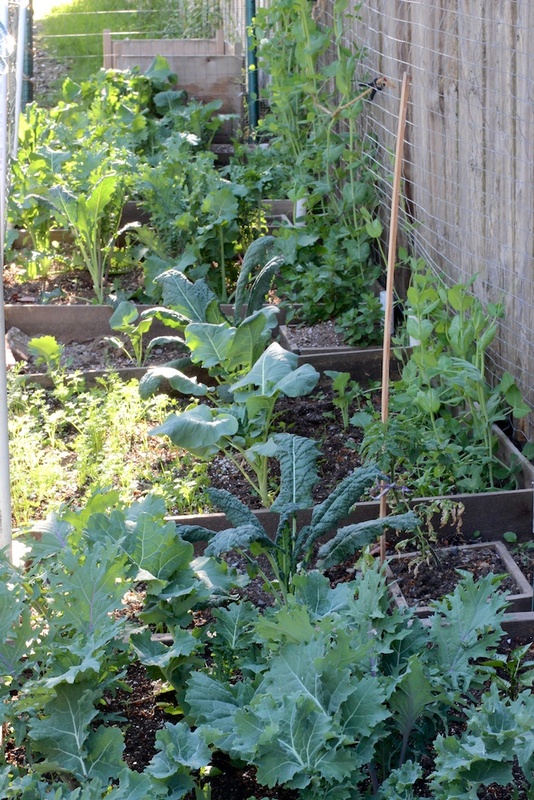 Around March I would relocate them back to another part of the yard and then rest the beds and grow beans and other green things that didn’t mind the heavy nitrogen. Inside I would start the growing season early under compact florescent lights and eventually move everything outside when they could handle the weather. Every inch of the garden had something growing in it and was flourishing enough to keep a grown man and his friends pretty well fed. I supplemented with food from the store and a local CSA organic vegetable delivery. 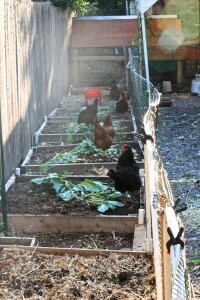 The left overs would go back into the beds so the chickens could finish it all off. I also kept a pretty nice compost bin which decomposed any remaining bedding from the coop and yard waste or vegetable remnants that the chickens wouldn’t eat. Eventually it all went into or under the soil and that was a base of peat moss, vermiculite and organic compost. Each bed had about seventy-five dollars worth of base soil in the first six inches and underneath that is where the compost I produced was placed for it’s final decomposition. Six inches under the beds was a worm factory decomposing the soil that once was mostly clay, sand and tree roots. Now the area is full of green cover crop and tomorrow my friends are coming over to take it to their gardens because they witnessed this whole four year process. 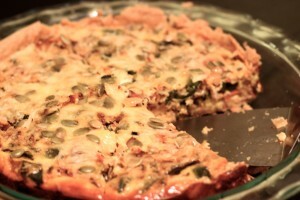 In the end I learned some basic permaculture and my friends are able to reuse what remains. As far as the rest of the stuff, I am trying to pass on what I think my friends and family would enjoy and then sell, donate, and dump the rest. When it’s all said and done I will have a storage unit to whittle away at for another few months and then find a place for the rest I plan on keeping. I have thought a lot about why I would keep any of it but truthfully I would like to have skis and some outdoor equipment so that I can keep skiing, camping and climbing while I’m still living in the Pacific Northwest. I would also like to have a little bit of stuff in case, or when I do move back onto land. Mostly kitchen stuff as the rest isn’t that important. If a man can cook, shower and have a bed to sleep on then he can survive until the rest of the home is assembled, which I doubt would take long. I have a year to get comfortable on Satori and make her my home. In that time I will also have time to complete much of the work that is needed to refit her for oceanic voyaging. I’ll miss the house; the garden, chickens and space to share but I’m excited every time do something to downsize even more. Each item that leaves the property is one step closer to living the dream. Much has happened lately and it’s time to fill you into it all. First off, last Sunday I gave my landlord the traditional thirty days of notice to vacate. I have been selling furniture and electronics to clear the house and planning the final move out process. I’ll get a storage unit to help out with getting my stuff out and later whittle that down to the basic necessities: ski equipment I can’t take with me, musical instruments and boxes of random crap. Unfortunately Satori wasn’t quite setup how I wanted her to be before moving in but the money I will save can go right back into her. 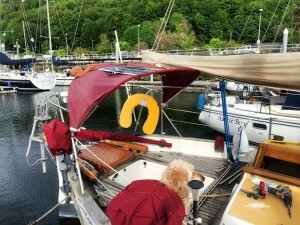 I need a new dodger and a bimini for better weather protection and also to hold my new flexible panels. I scratched my original plan of using rigid panels for two reasons: first is that the frame I put together using bimini parts was poorly built and did not work. Even as a proof of concept I could see where the design flaws were at. Second, rigid panels are too cumbersome when compared to flexible panels and the price difference is not that much anymore. I found a Renogy 100 watt panel for $220 on Amazon Prime. I was also lucky that the rigid panels were defective and when I asked Grape Solar about trading in for flexible, they said they would do it for the cost difference. Grape Solar is one of the few remaining companies out there who treats their customers with great service. I cannot express my gratitude enough for being able to use all flexible panels instead and I saved $500 and really lucked out this time. 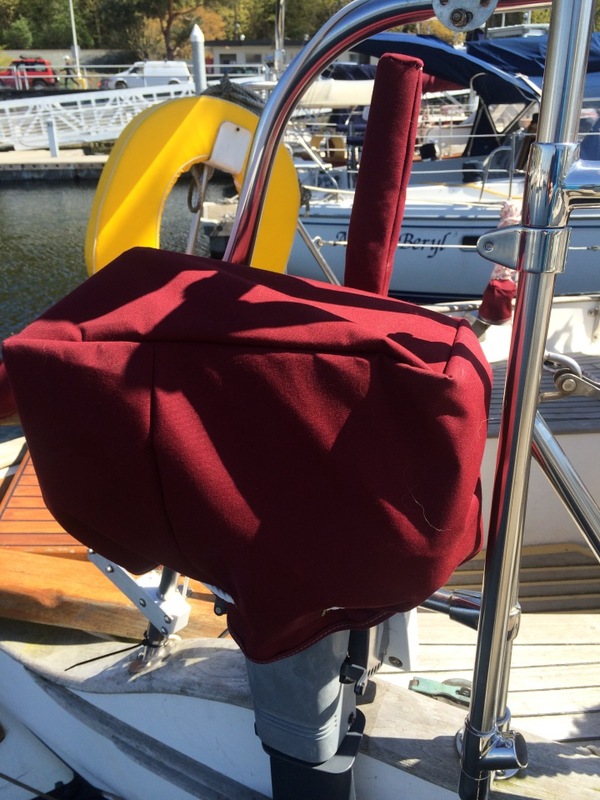 I can now incorporate lightweight panels into the bimini and dodger canvas and even add a tarp here and there while anchored with a panel attached that can collect even more sun energy. Currently my amperage limit is 40 amps which is about 480 watts maximum. That is really only about four 100 watt solar panels because it is possible to draw more than 8 amps per panel on a really hot and sunny day. I risk blowing a fuse if I go any higher and I’ve read that you need some wattage buffer for this very reason. This weekend I tore out my old dodger and started looking at how to repurpose the frame parts. They match the boom gallows frame width and bend radius so I could hypothetically reuse them as a bimini using the gallows as the base frame and then install panels onto it. 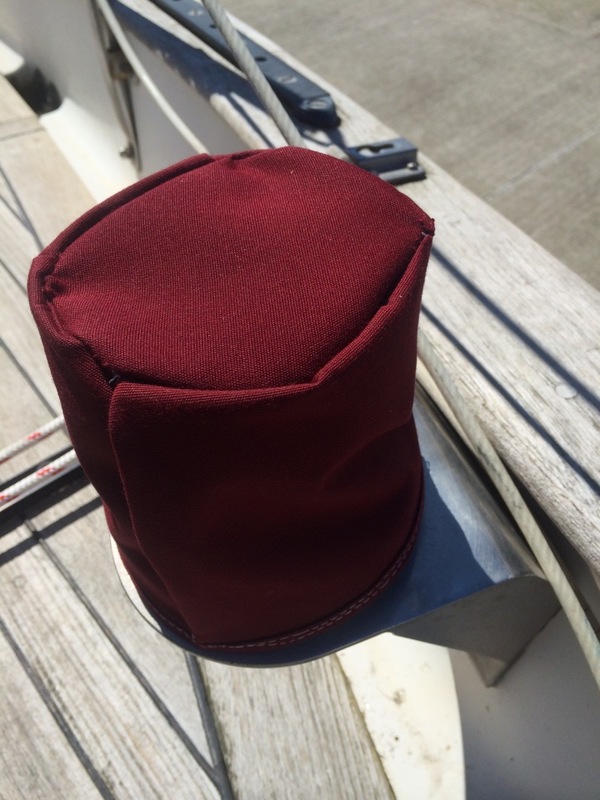 I have been learning the trade of canvas work by building covers for the various sun exposed hardware on the boat. I started with my tiller, outboard motor, tiller pilot and winches and have a good understanding of what it will take to make a custom bimini. 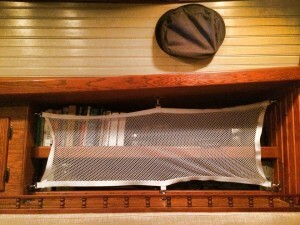 I have a bunch of bimini parts laying around and can you believe that none of them seem to be the right part for repurposing? That’s right, I have to buy more. Anyways, It’s really not a big deal as the reward will be huge with adding a new cover over the boom gallows. I will have weather protection and a place to put my solar panels. I have decided on the make and model of Dodger I plan to go with and will be putting a downpayment to reserve time to build it this week. The Iverson’s iTop seems like the best crafted dodger in the industry and going with the standard of ‘built to last’ strategy I think it’s worth the expense. 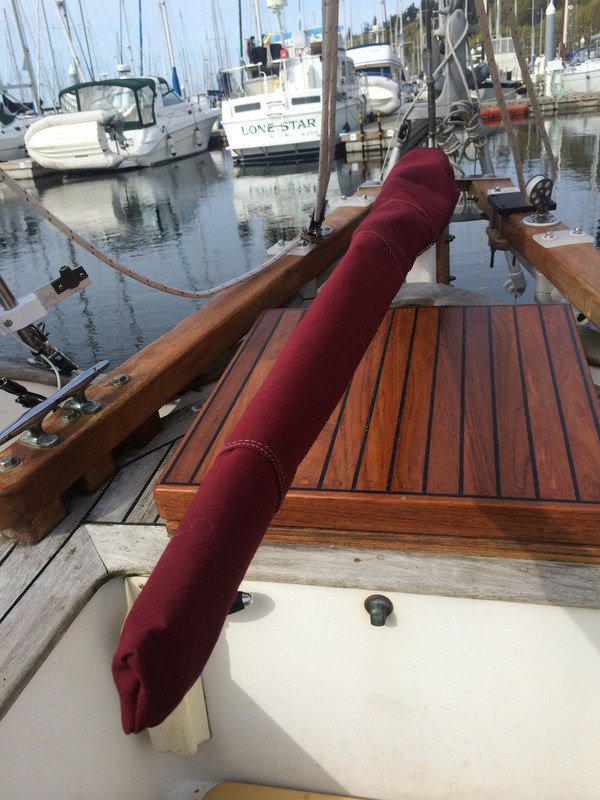 There are other things that could also use some TLC but nothing says awesome boat like a bunch of new canvas. It will be months before this is completed so I’m going to start squirreling away now. 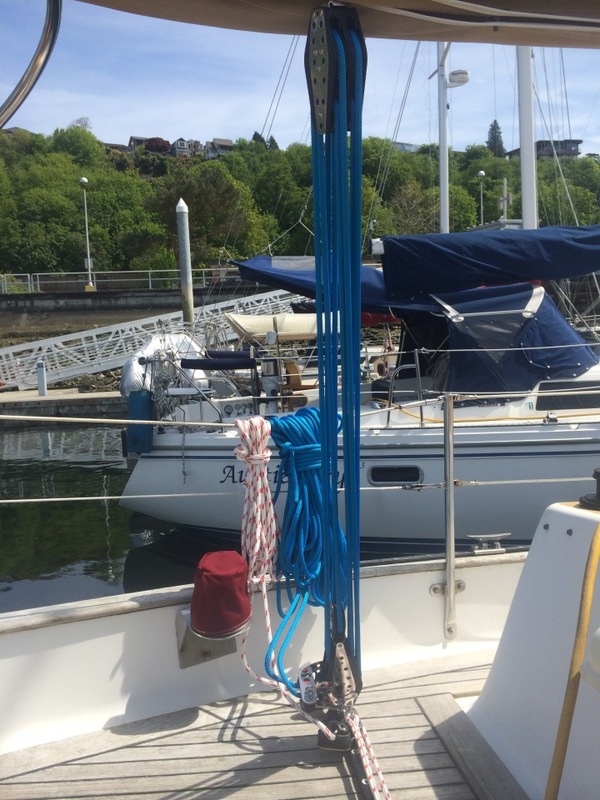 Another project that is nearing completion is the new traveler system I employed Dean from Northwest Rigging to install for me. 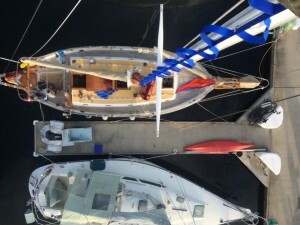 He installed the through-bolted track and bail on the boom over the last couple of weeks but the block and cleat system is still being delivered so hopefully by next weekend I’ll be able to take Satori out to see how it works out. 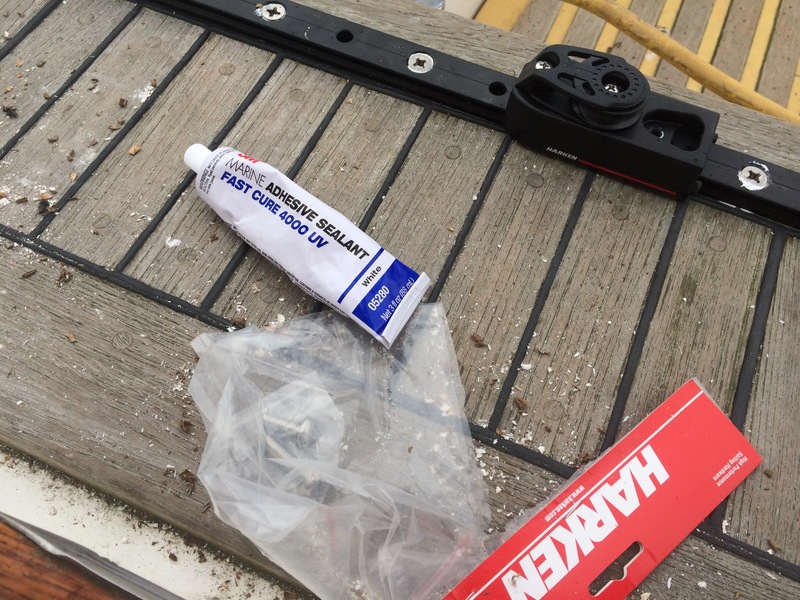 With the left over parts I can also reuse them for making up a soft boom vang to get some more shape from my mainsail. Then I can move on to getting the staysail loose footed and then finally a roller reefing/furler system for the new genoa Frank will be making this fall. It’s all coming together and by next year I suspect Satori will be ready for the left turn. Sailing in twenty knot winds on any point of sail is absolutely awesome. 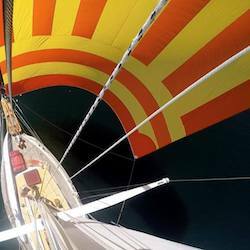 Satori can take just a staysail on a reach or run and maintain four to five knots. The tiller is easy to handle and keep her in control for relaxed cruising. 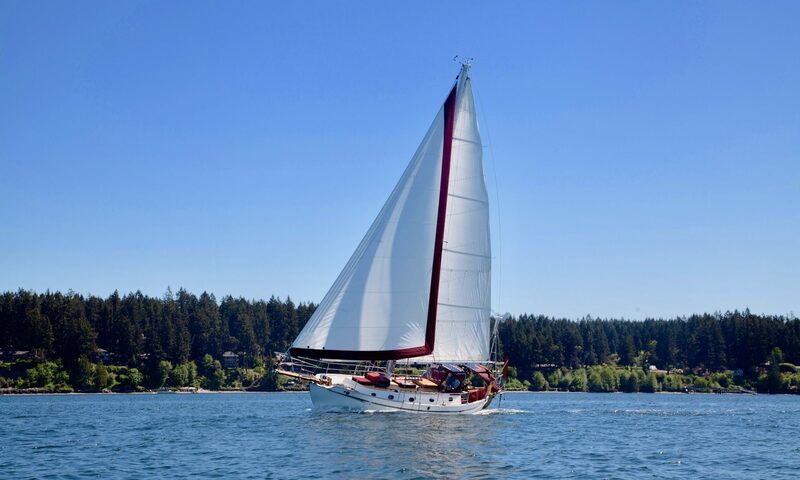 Raise the mainsail and she can go up to two knots faster, but on a downwind run the tiller tends to have a very different resistance at different surges of the swell with following seas. Balancing the sails to keep her moving at max speed without accidentally jibing or heading up can be tricky, but with some good seamanship Satori can hold her course indefinitely. I’ve been conservative about handling weather helm and tend to make more deliberate maneuvers when it all feels right. I might move slower through the water but I am also enjoying fewer epics. I’m learning proper seamanship with a ‘safety first’ approach and working my way up into greater Beaufort scale numbers. I’m comfortable up to Beaufort five and would like to spend more time sailing at that wind speed before moving up to Beaufort six. It reminds me quite a bit of rock climbing, where the grades are a matter of comfort zone. I was comfortable leading 5.10 in just about any situation, including climbs that had never seen an ascent before. I could even work out a 5.11 with enough dedication spending time on 5.10’s. So if the Salish Sea can deliver more Beaufort fives then I can start working enough courage to attempt a six. I’m guessing skilled sailors can keep their boat under control up to eight and then also be able to simply heave-to when it’s time to stop sailing and just wait for better winds. The last weekend of March some friends and I sailed Strange Advice and Satori out to Blake Island for an overnighter. I had my friend Stew on board, complete with his own Mustang full-body survival suit. The first part of the sailing trip was great but I was just sailing with the mainsail and stays’l just to see if the winds picked up more than twenty knots. We came across some big waves head-on as we entered the traffic lanes which buried Satori’s entire bow at one point. Later the seas died down and we began sailing but just when I raised the jib to pick up speed the winds died to zero knots. We motored for thirty minutes and we were at our anchorage for the evening. 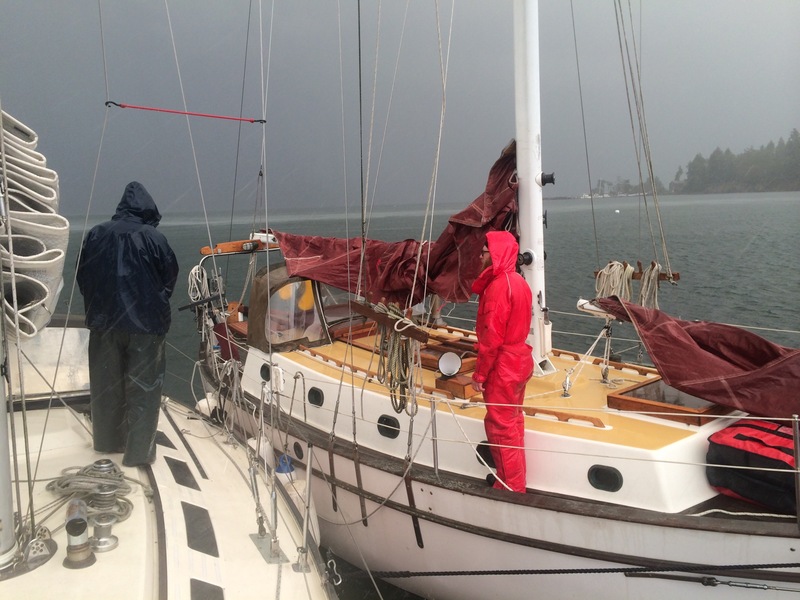 The next day we headed back to Ballard and encountered some steep rolling waves and great winds. Both of us started out with just a front sail and then later I put the mainsail up and she picked up speed and maintained 6.4 knots SOG. The tiller pilot worked well when it was just the staysail but because of the surges it was more difficult keeping her directly downwind wing-on-wing. At one point she accidentally jibed and fortunately I was paying attention to sheet in and let out when it happened. The controlled jibe headed towards Elliot Bay at what felt like mach speed. I brought her back around again and kept on heading south and we were at Shilshole pretty quickly. Getting back into the slip has now become much less of an issue as well. What was once a frightening maneuver is now pretty chill. Stew and Brent work on rafting Satori and Strange Advice in a squall. In the next weeks I will be trying to move into Satori and live the dream. I once thought this life was never going to happen and had a difficult time imagining it but now I’m right here in the midst of going from a big box on land to a much smaller and much more enjoyable float on water. This reality is the beginning of what was once just a dream.